Guess what folks? We have snow in the White Mountains and in the Mount Washington Valley! Winter has been here since November and the temperatures have remained cold so the snow is not going anywhere. As of the writing of this blog, we are expecting a snow storm that may drop another 12 to 18 inches of snow in the Mount Washington Valley area with likely more in the mountains. This with the cold temperatures virtually assures a long, snowy winter for “SNOW” much fun on the slopes – and, we are still only in January! Surrounded by the White Mountains and only 10 miles south of Mount Washington and Pinkham Notch, 12 miles north of Cranmore Mountain and about 40 minutes from Bretton Woods on the other side of Mount Washington the Inn at Ellis River is centrally located to several ski locations. Plus, there is Jackson’s own Black Mountain, voted #1 Best Ski Area NH 2019 according to WMUR Viewers’ Choice only about 5 miles from us. Whether a novice, intermediate level or an expert, the place to be this winter is here in the White Mountains of New Hampshire. After four years as the Innkeepers of our beautiful Inn at Ellis River, a bed and breakfast in Jackson, New Hampshire, directly alongside the Ellis River, John and I finally decided it was time to re-learn to downhill ski (it’s been more than 25 years and we weren’t very good at it)! We tried beginner lessons at the Cranmore Mountain Resort in North Conway recently and plan to take advantage of the other wonderful ski locations as well. We had an amazing first lesson – I fell only once which for me is fantastic and John remained upright the whole time. Alongside some small children also taking lessons, we made our way down slopes used for beginners so we could practice going downhill, turning left and right, learning to slow down and stop, etc. We had more fun than we expected and are going back again this week. We plan to get better and better so we can hit the slopes with everyone else including our (almost) middle-schooler! We partner with many of the ski areas for discounted trail passes so come, book a stay at the Inn at Ellis River this winter – maybe we’ll see you on the slopes! Black Mountain – Located right in Jackson, Black Mountain is one of the oldest ski areas in New Hampshire having its first ski trail developed by the Civilian Conservation Corps in 1934. It’s ski lift, also one of the first in New Hampshire, was created by George Morton who was a local inventor. The plant used to power the lodge and lift back in the day was owned and operated by Edwin Moody who also owned the Black Mountain ski resort. Black Mountain offers terrain for all ski and snowboard levels from beginner to expert with novice slopes, intermediate and black diamond trails. Wildcat Mountain – Near Jackson in the Pinkham Notch area, Wildcat Ski area is located about 10 miles north of the Inn on route 16. With its highest slope at 2,112 feet, it is the second largest in New Hampshire and ninth largest in New England. Wildcat Mountain has 49 trails on 225 acres and with an annual average of 200 inches of natural snow, it is not unusual for its ski and snowboard season to last from mid-November through early May. Wildcat and Attitash are owned by the same party so tickets are good for both resorts regardless of where purchased. Attitash Mountain Resort – In Bartlett on route 302, approximately 7 miles from the Inn, Attitash covers two mountains: Attitash and Bear Peak with a total of 68 ski runs and 10 chair lifts. Attitash is for all ski levels carrying terrain from most difficult to the easiest. Annual snowfall is approximately 120 inches with their ski season generally running from November through April but always dependent on weather, of course. Attitash’s summit elevation is 2,350 feet and Bear Peak is 2,050 feet. Cranmore Mountain – Another mountain ski resort near the Inn at Ellis River at about 12 miles south of us in North Conway is Cranmore Mountain Resort. Cranmore was established as a ski area in 1937. It was owned by the same family until 1984 after which it changed hands over time. With more than 200 acres of ski terrain and elevation of 1,200 feet, this mountain has 54 trails and lifts. The trails are a mix of black diamond, intermediate and beginner. They have snowmaking capabilities on all terrain and also have a tubing hill. Bretton Woods – Bretton Woods ski area is about a 40-minute drive from Jackson, New Hampshire past Bartlett also along route 302 and through the Crawford Notch. It is the largest in New Hampshire for downhill/ alpine ski with 101 trails. Jackson XC – Touring Center – In the center of Jackson Village, lies the Jackson Touring Center which is a nonprofit community-based organization which maintains 150 kilometers of cross-country ski trails that are “considered by many to be the finest cross-country ski trails in the Eastern U.S.” The trails are groomed with the latest technology machines. Their trails are wonderful for beginners through experts and XC racers. The Jackson Touring Center also has several snowshoe trails. There are true experts here to provide private and group lessons. We feel blessed to be so close to the Jackson XC Center with the Ellis River flowing directly behind our Inn so we can see all the high-energy skiers zipping by each day! Great Glen Trails – During the winter months, Great Glen Trails offers 45 kilometers of cross-country ski and snowshoe trails plus a do-it-yourself tubing hill. It also offers Snow Coach tours to the tree line of Mount Washington so you can view its “sub-arctic world” this time of year. Great Glen Trails also has snowmaking capabilities and at the base of Mount Washington and also with 1,600 base elevation, the views ae spectacular. 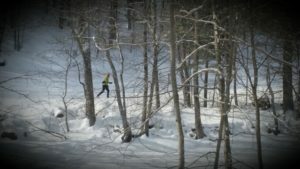 Bear Notch Ski Touring Center – In Bartlett about 12 miles from our Inn, Bear Notch Touring Center offers more than 65 kilometers of riverside views, waterfalls and challenging hills for cross-country skiers. They also have a warming hut with hot chocolate, soups, water and other goodies while you’re out on the trails. This entry was posted in Outdoor activities by admin. Bookmark the permalink.